Located next to the American Jazz Museum in Kansas City, Missouri, the Charlie Parker Memorial pays homage to one of the innovators of jazz music. Charlie Parker was one of the most influential performers and composers of jazz music to have ever put his lips to brass. The fittingly brass statue of Parker’s head is an 18 foot tall effigy that attempts to capture the musician in his most natural state: playing music. The downward tilted head has the closed eyes and pursed lips of the jazz musician in mid-blow, paying tribute to Parker’s life-long devotion to the saxophone. The words, “Bird Lives” are inscribed in the base of the statue, recalling both his famous nickname and his eternal music which will ensure that his legacy survives into the foreseeable future. 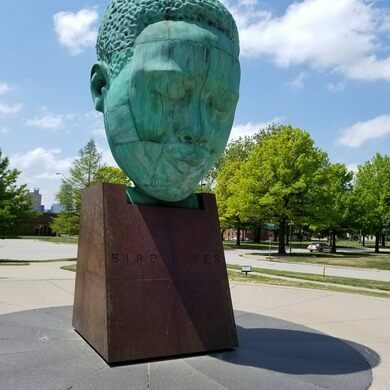 Located at 39.0919-94.5638.In a small park adjacent to the American Jazz Museum, the Memorial is the focal point of the park on East 17th Terrace.Address: 1540 E. 17th Terrace, Kansas City, MO.